India, Marrakech, Kazakistan - those are just a few of the places where Rena Thiagarajan, Adventurer in Chief of the travel and lifestyle brand, Bly, has been; and where she has brought back pieces that are part of her beautifully curated home in San Francisco. The founder of Bly, Thiagarajan launched the site dedicated to marrying travel and design, an online portal that helps consumers shop the world’s markets and secret souks. With a curated collection of textiles, art, jewelry, and decorative objects from around the globe, it's no wonder that Rena's home is dedicated to that same sense of discovery, featuring a beautiful symphony of treasures that she has collected over the years. 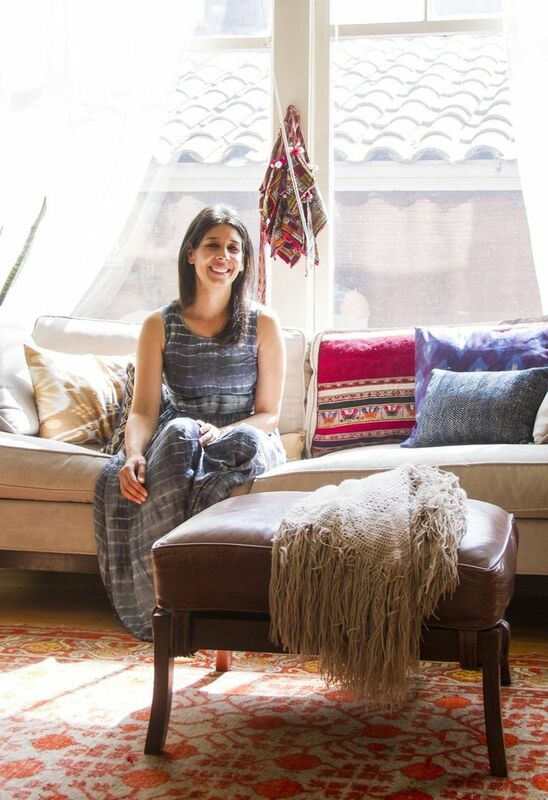 The design of Rena's home begins with her Indian heritage. Pieces from India, Morocco, and South Africa sit side-by-side. The melange of items comes together to create a warm and personalized space, with each piece offering a unique story. In the living room, brass teapots from Mumbai and Marrakech add a glow. And Bolivian textiles on the sofa add a dose of pattern. The room is also home to one of Rena's favorite pieces - her rug. "The muted gray rug with red pomegranates in my living room is from East Khotan, an oasis town on the historic Silk Road located on the edge of the Taklamakan desert in Northwest China," says Rena. "This rug inspired me to read voraciously about the Silk Road and visit Bukhara, Uzbekistan — another famous stop for camel caravans." In addition to her collection of global textiles, including brightly hued cushions and blankets from around the globe, this home also features an abundance of art. On the midcentury console a barber shop trade sign from South Africa is a unique piece that fuels the room's color palette. The bright hues are reflected in the abstract paintings on the gallery wall in the living area. Throughout her home, collections are artfully displayed on consoles, benches, and even gently leaned against the bedroom wall. Well-read and well-traveled, Rena displays some of her favorite books below a framed piece of art in the living room. In the bedroom, a beautiful deep purple rug sets the stage. It's just the type of piece you can find on Bly, exploring items and their origins and receiving them without the headache of travel. You can even explore different regions, following along the site's travel journal where you can explore markets in Mexico, Morocco and beyond. The rug is likely from a Persian market, a handmade piece that took months to create on a loom. The neutral bed is the perfect backdrop to Rena's collections. Simply placed on the bed, a shimmering Moroccan pillow adds a dose of color. Over top of the bed, an abstract painting by John Tun Sein makes a statement in the minimalist bedroom space. Propped gently against the wall, a triptych of paintings takes up residence on the floor of the bedroom. Featuring a taxi scene, the colorful paintings fill out the room's color palette of deep purple and bright red. Around every corner there is something absolutely beautiful to treasure in this San Francisco home. In one room, pieces from the souks of Marrakech. In another, a collected textile from the Fergana Valley in Uzbekistan. Or maybe a Shibori from in Japan. They're can all be found here in this eclectic home. Treasures inspired by Rena's love of discovery, going down the unbeaten path, and finding the unexpected. It's what has helped her create a living environment filled with breathtaking storied pieces that hail from every part of the globe. "Your home should be a reflection of who you are, where you come from, and where you want to go. Most importantly, it should be a place to put your feet up and dream, so make sure you buy a comfortable couch, preferably wide enough for two!"